One of the Village People wore a cowboy hat, but if you think Western disco ended there, you're sadly mistaken. Respected session guitarist Grady Martin made a western album in 1977 that was so un-traditional -- so bizarre, in fact -- that it's hard to imagine that an audience existed for it. The 1999 CD reissue of said album seems almost sinister when you consider the disparity between what you see and what you get. 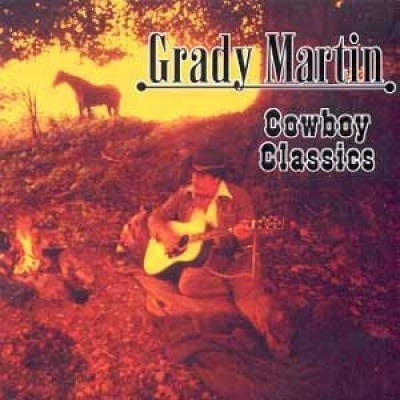 The cover photo pictures Grady Martin in western wear strumming an acoustic guitar by a campfire, and the track listing, with classics like "Shenandoah" and "El Paso," looks fine. The first cut, "Riders in the Sky," even begins with narration by singing cowboy Rex Allen, but then the 16th notes on a high-hat cymbal strike that familiar disco beat and heavy synthesizer chords descend like flying saucers over the range. "Cool Water" is similarly disco-fied and "High Noon" gains a distorted guitar lead, while "Tumblin' Tumbleweeds" and "Streets of Laredo" receive jazzy interpretations that nearly obliterate the melodies. The one "bonus" is a previously unreleased, half-minute-long reprise of "Riders in the Sky."